Every human being on this planet has skills and knowledge that is valuable to others and therefore can be monetized by becoming a teacher or tutor. Most people don’t realize this. They think that to be a teacher you have to have a university degree, be an expert in your field or know everything there is to know about a subject. This notion prevent people from taking action and reaching their full potential. Why? Because you don’t need to be an expert in order to teach. If you know more about a certain subject or are better at something than most of us, you can already bring a lot of value to the table. Corbett Bar runs a blog named Expert Enough that is completely based on this realization. This makes a lot of sense. A 3 is probably in a better position to teach a 2 than a 10 would be, as a 3 can relate to a 2 and understand the struggles at that level. So don’t think that you need to be the world’s biggest expert to be able to teach. Teaching and tutoring is a great way to temporarily pay the bills while working on a long-term business or project. You can even teach online from anywhere in the world! There are several platforms that connect student with teacher. They are all free to sign-up and typically take 20-30% commission. It’s very easy to sign-up, so check these out. Wyzant focusses on academic subject such as math, languages and computer science. They claim to have tutors within 10 miles of 93.7% of the US population and over 3 million hours have been taught through the platform. What’s cool about Wyzant is that you can set your own rate, unlike some of the other platforms. To get started, simply complete an online application. A WyzAnt staff member will review your application and respond to you within 24-48 hours. Takelessons started out as an online marketplace for music lessons but they have recently expanded into other verticals such as academic tutoring and the performing arts. They offer online teaching and their teachers have earned over $25 million. You can sign up here. Tutor.com has logged over 11 million lessons and pays their tutors a standard rate that varies per subject. There are some restrictions to become a tutor, for example you have to reside in the US and be a college sophomore or higher. You can apply here. InstaEDU is an online-only tutoring platform, which means that you can tutor from any location in the world! Their individually screened tutors cover more than 2,500 subjects, ranging from basic subjects to AP material to advanced college courses. Tutors get paid a standard $20 per hour. You can sign up here, all you need is a Facebook account. Update (11/21/2014): Check out italki.com for teaching languages online! This is part three of the Monetization Series, in which the author shares his knowledge on how to effectively monetize your assets, skills and knowledge. Join the conversation! 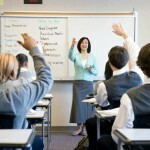 Have you ever considered teaching or tutoring? What’s your experience? I’d love to hear about it, comment below! If you know of any other platforms, please let me know as well so I can add them! I’ve always wondered how to go about passing on some of my skills and knowledge and at the same time earn an income as i travel. This might just have pointed me in a new direction! Cheers. Hey Dave, great to know you find this useful. Let me know how it goes! I’m. Going to give this a shot, Jasper. Great post and I liked your tips which you have mentioned here. I’m a teacher so I like to teach and share my skills with students as much as I can do. I will suggest here a link for the teachers http://www.selectmytutor.co.uk/tutoring-jobs.html just visit here to start tutoring jobs in London, Uk. I’m using this platform and I’m happy with it.